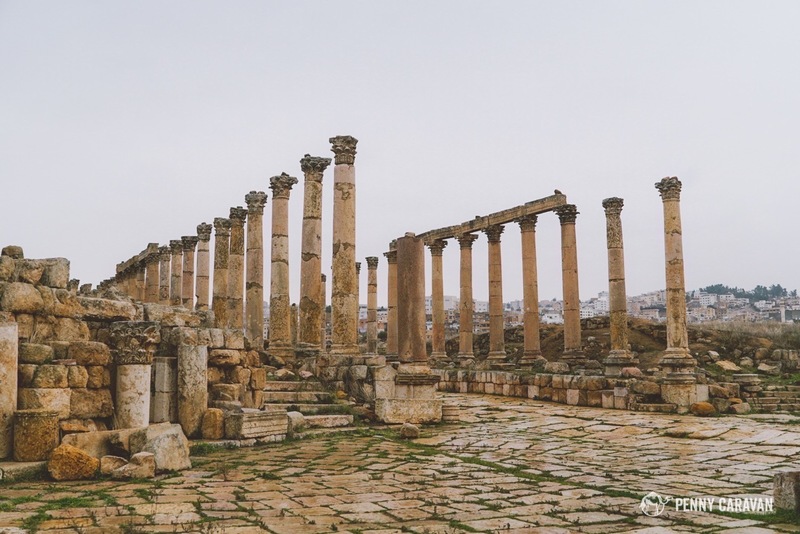 If Petra is to Jordan what the Coliseum is to Italy, then Jerash is Jordan’s Pompeii, which, as it so happens, is a nickname for the ruined Roman city. 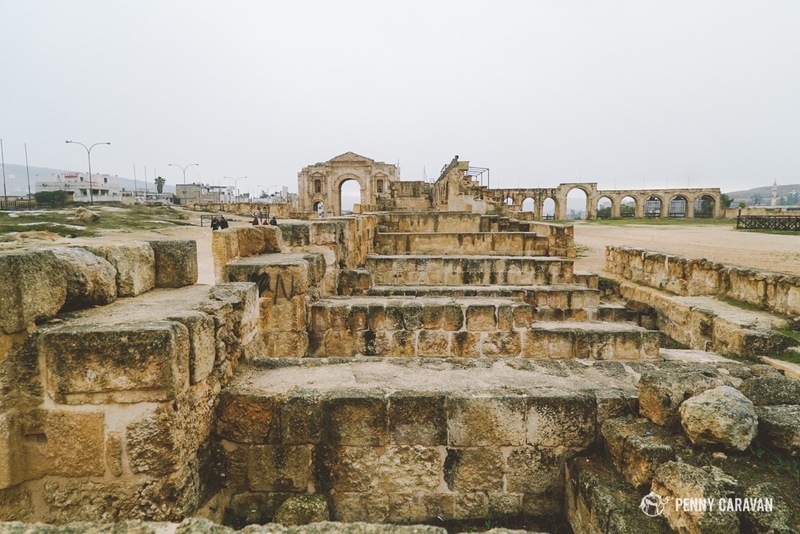 While never buried under volcanic ash, Jerash is known as the “Pompeii of the East” because of how well-preserved it is, owing its state to the dry climate of the region (no small irony that it was cold and rainy the day we visited). And although there was no Vesuvius, the city was still beset by natural disaster, with earthquakes contributing to its eventual abandonment. 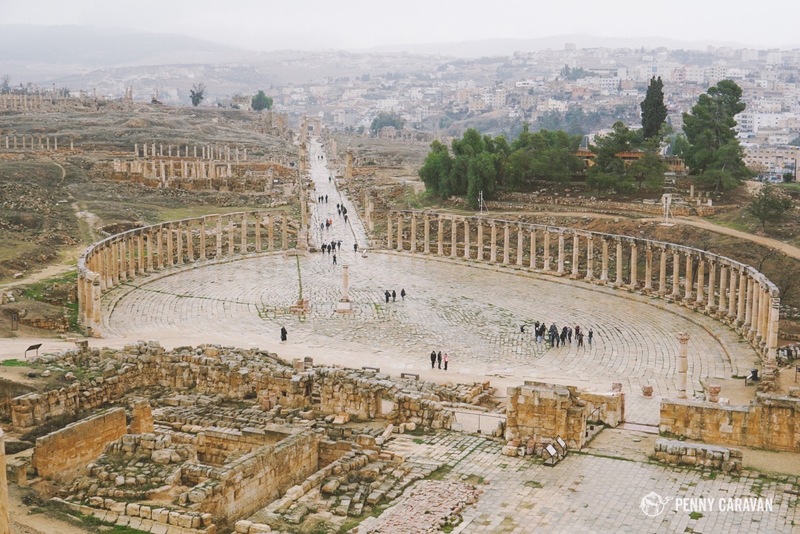 Jerash, open daily 8am–4:30pm Winter; 8am–7pm Summer. 8JD entry fee; included with Jordan Pass. 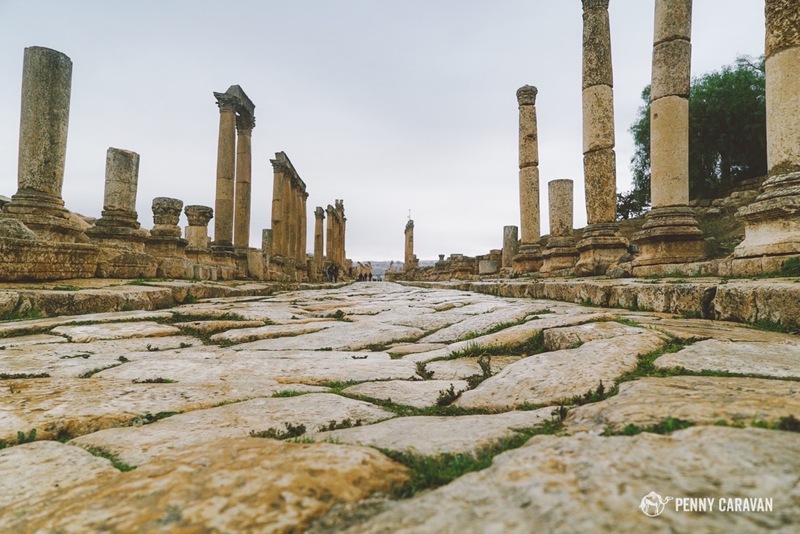 Inhabited for thousands of years, Jerash was formally settled during the time of Alexander the Great, but it was under the Romans that the city really flourished. As Petra declined, trade routes shifted north to the Decapolis, of which Jerash (called Gerasa in ancient times) was a part. Construction boomed in the first and second centuries A.D., and many of the landmark attractions were built during this time. It remained an important outpost in the Byzantine era until the earthquake of 749AD caused residents to flee. 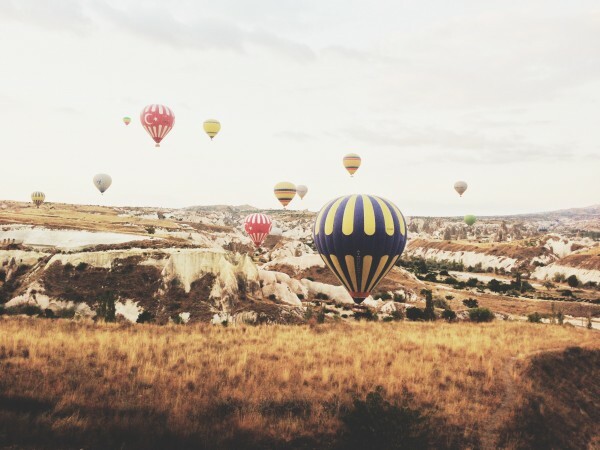 For centuries it lay mostly uninhabited except for minor settlements in the area, until refugees from Russia arrived in the late 1800s and the archeological treasure trove within was announced to the world. 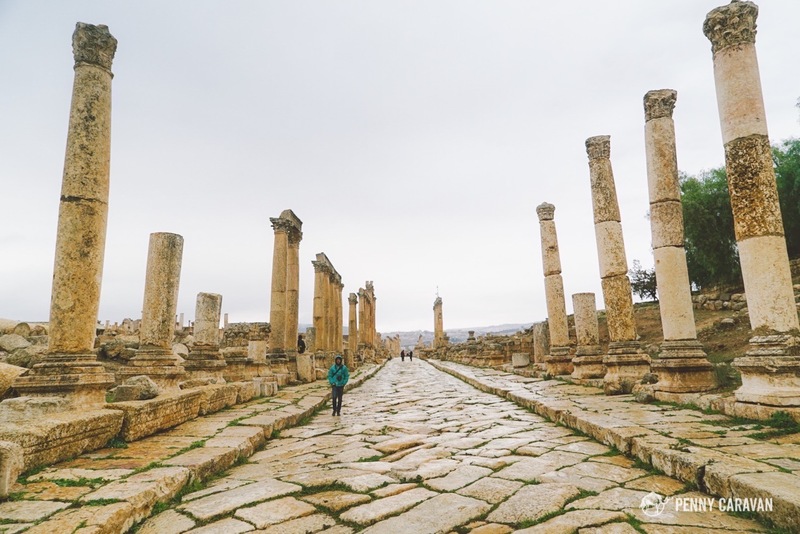 Since then restoration and excavation has been ongoing, and the modern city of Jerash has thrived around it. 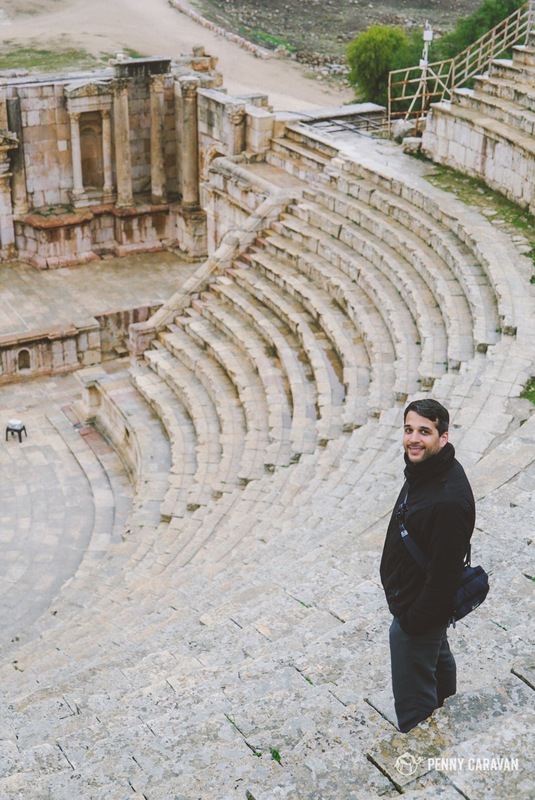 Jerash is most often visited as a day trip from Amman, which is about a 45 minute drive to the south. 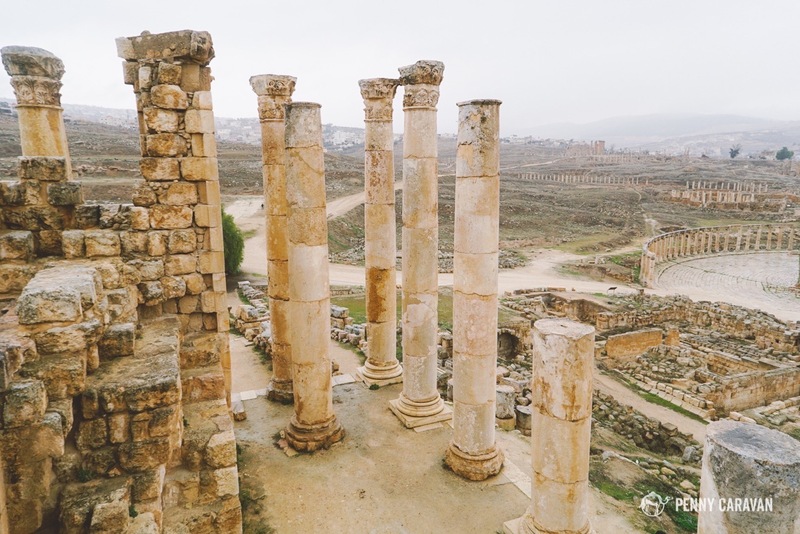 So if your itinerary has you flying into Amman, take some time for the quick trip to Jerash before heading south to Petra. Most any taxi driver will be willing to drive you to Jerash, or you could book a driver through localtrips.net for about 60 JOD. 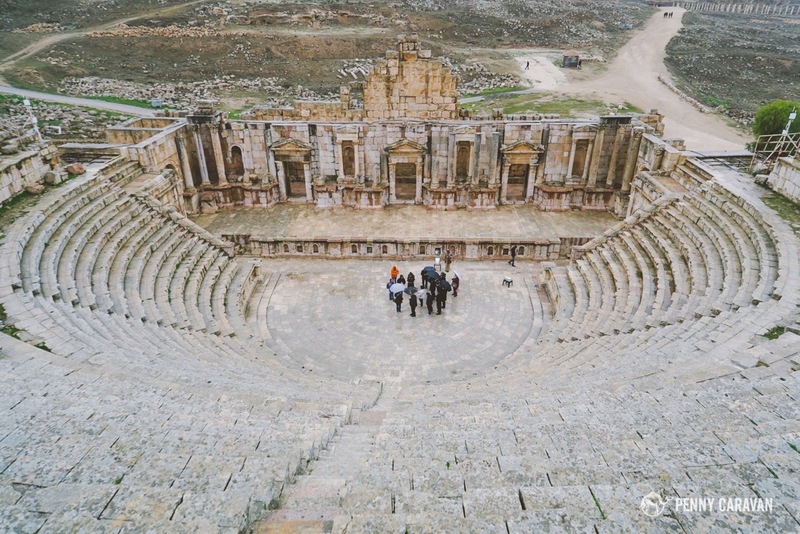 We used their service to book a driver from the Dead Sea to Amman and included a stop in Jerash on the way, helping us to save some time and money by combining our transit with the visit. 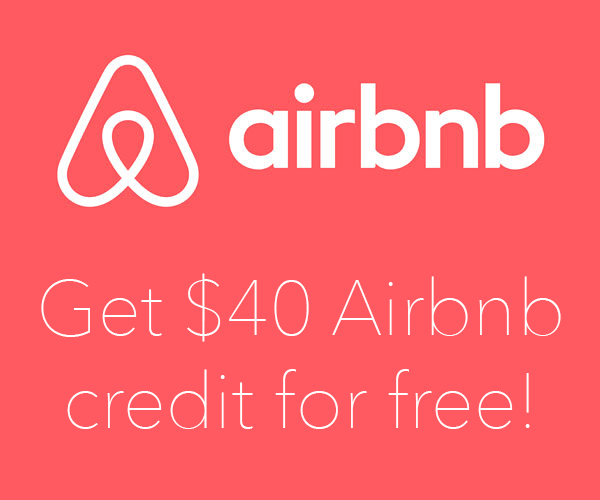 Alternatively, you could rent your own car, which is an excellent way to traverse Jordan. The road between Amman and Jerash is wide and well-maintained. Public transportation is also an option with frequent busses from Tabarbour station running to Jerash for a few dinar. 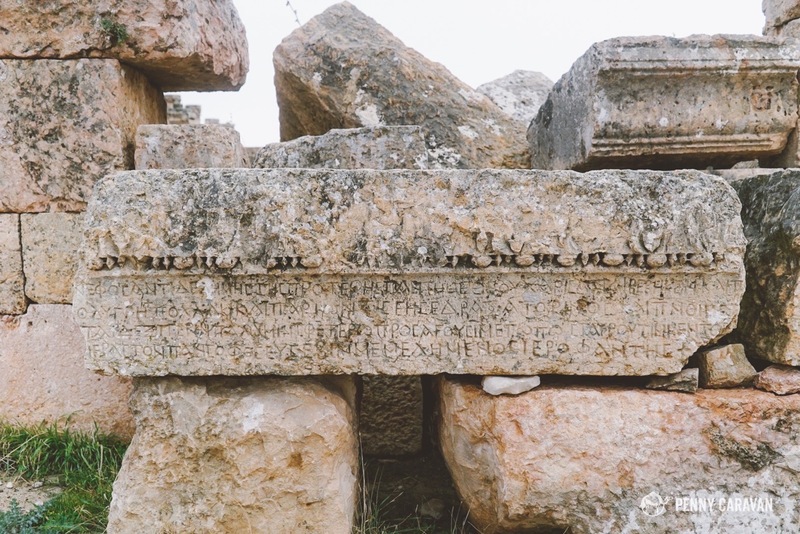 Signage is easy to follow to get you to the modern city of Jerash, and from there to the entrance to the ruins. There is a large parking lot where your driver will stay or you can park if you rented a car. 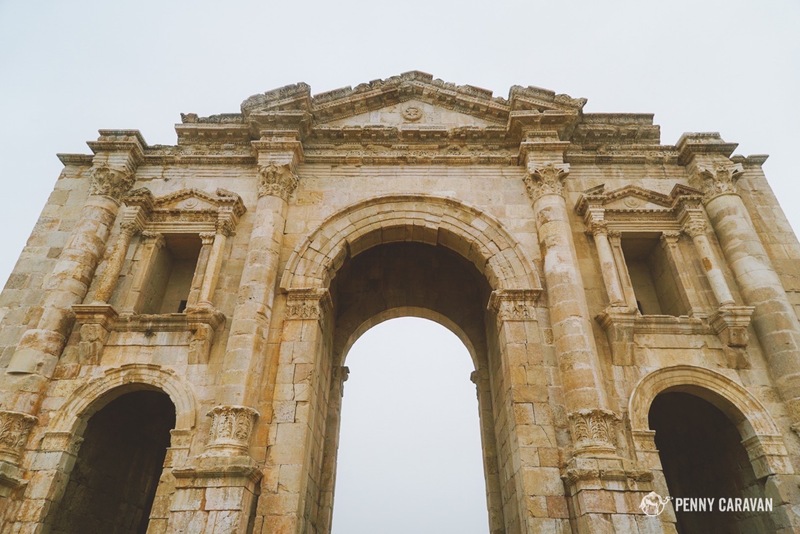 From the parking lot, pass through the large covered market and you’ll be at the entrance to Jerash, marked by the impressive Hadrian’s Arch, the first of many notable structures you will see. Plan to spend 3-4 hours to cover the grounds. 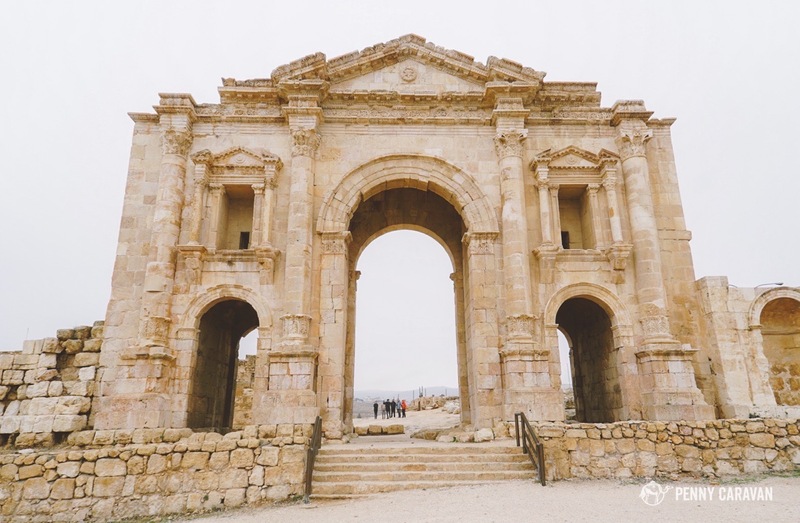 Jerash welcomes you in the most magnificent way, with the imposing Arch of Hadrian marking the entrance. 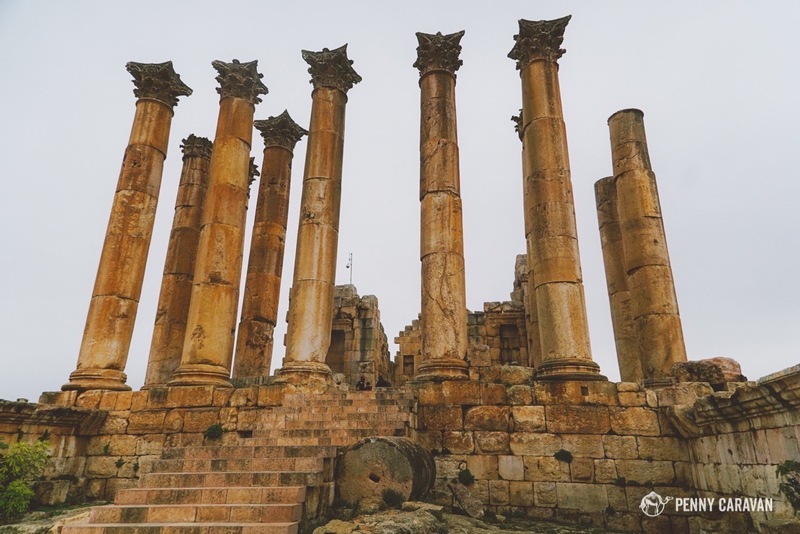 Constructed in 129AD to commemorate the visit of the Roman Emperor Hadrian to Jerash, it originally stood twice as tall as its present height. South of the city wall, the arch was likely built with the intention to expand the city, but those plans never came to fruition. 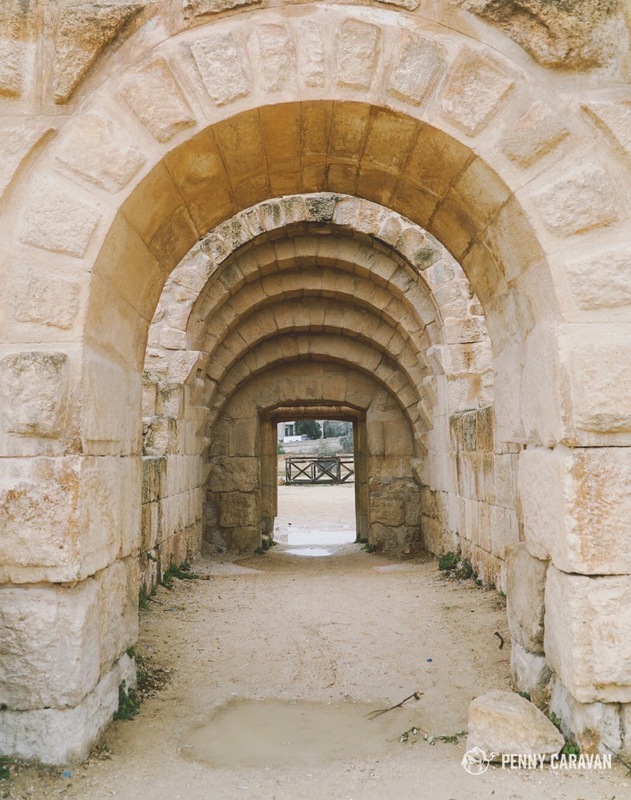 Admire the detail in the arch and try to imagine how impressive it was at its original height before moving through toward the Hippodrome. Hadrian’s Arch once stood twice as tall as its present height. Look how tiny those people are! 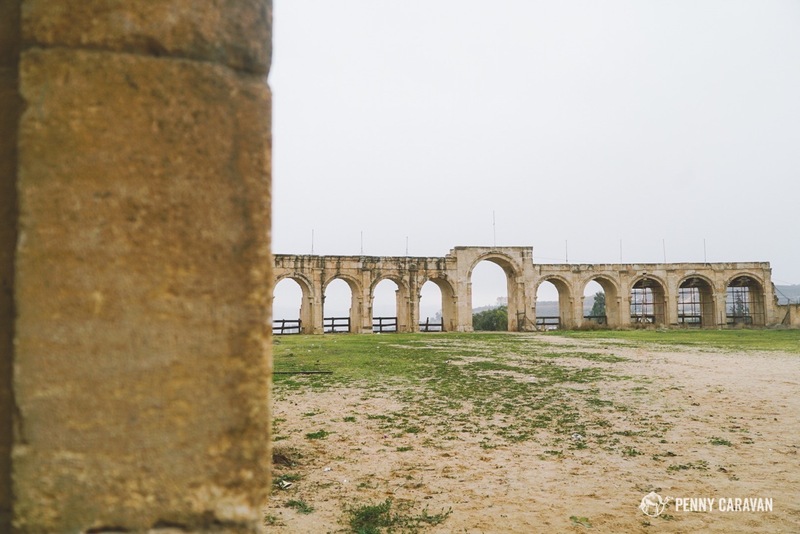 Also situated outside the city wall, the Hippodrome once hosted up to 15,000 spectators for chariot races and gladiatorial combat. Walking amongst the ruins you can see the horse stalls that once sat underneath the spectator seating, along with arches along the perimeter of the circus. Check with the visitors office for the schedule of live reenactments that occur multiple times daily except Thursday, replete with chariot races and mock combat. After you’re done at the Hippodrome, move through the South Gate and toward the theater. Horse stalls in the Hippodrome. As you move through the South Gate you will see the Forum ahead to your right. Before heading there, swing left up the hill to the South Theater, and impressive facility that seated 5,000 for musical and theatrical performances. The theater is known for its acoustic properties, and the performances of a small band comprising a bagpipe player and some drummers reverberate throughout in demonstration. Explore the grounds around the theater to imagine the community gathering on a cool summer night to see the latest drama. At the top of the South Theater. Would have been a great place to catch a show 2,000 years ago! Adjacent to the South Theater is the Temple of Zeus, perched atop a hill overlooking the rest of the city. With its location above the denizens below, it was surely a powerful symbol of the imperial rule and religion. 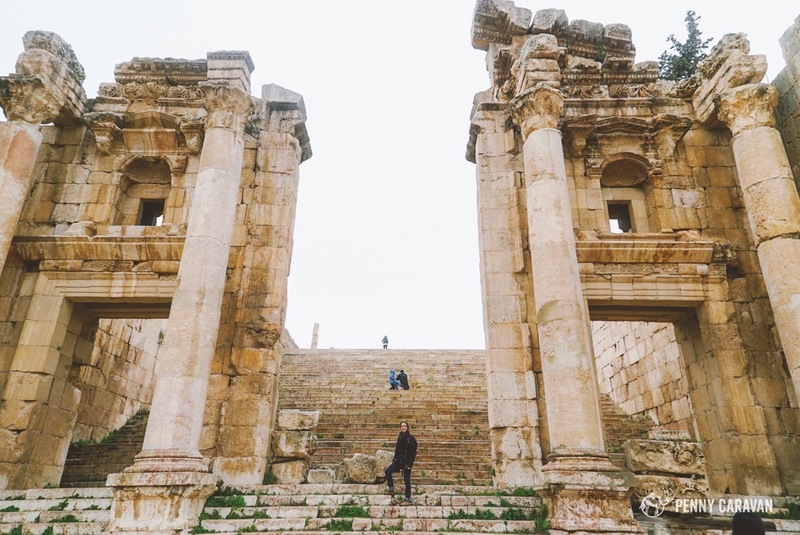 Now mostly toppled, you can enter into the area once reserved for priests and ascend steps to a second level to get a breathtaking view of ancient and modern Jerash. You’ll see the forum with the cardo maximus extending from it, the next checkpoint in your journey. The Forum seen from the Temple of Zeus. 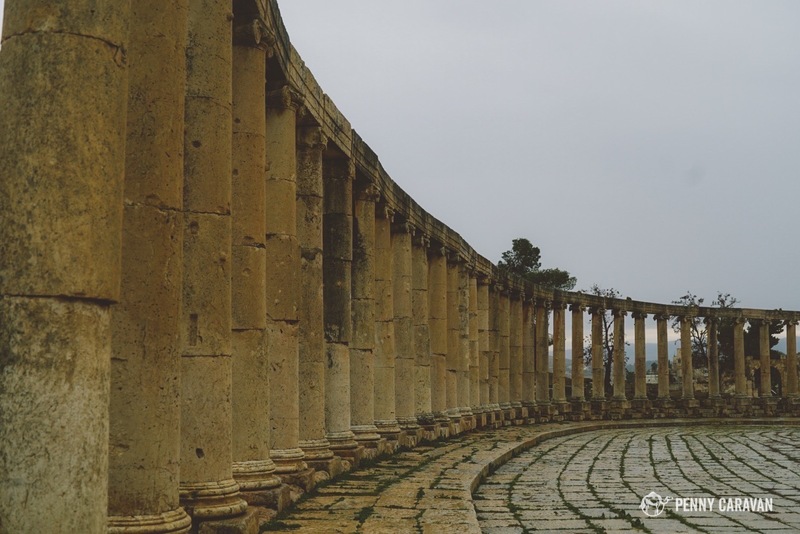 The cardo maximus extends from the forum and served as the main thoroughfare for Jerash, running North-South. 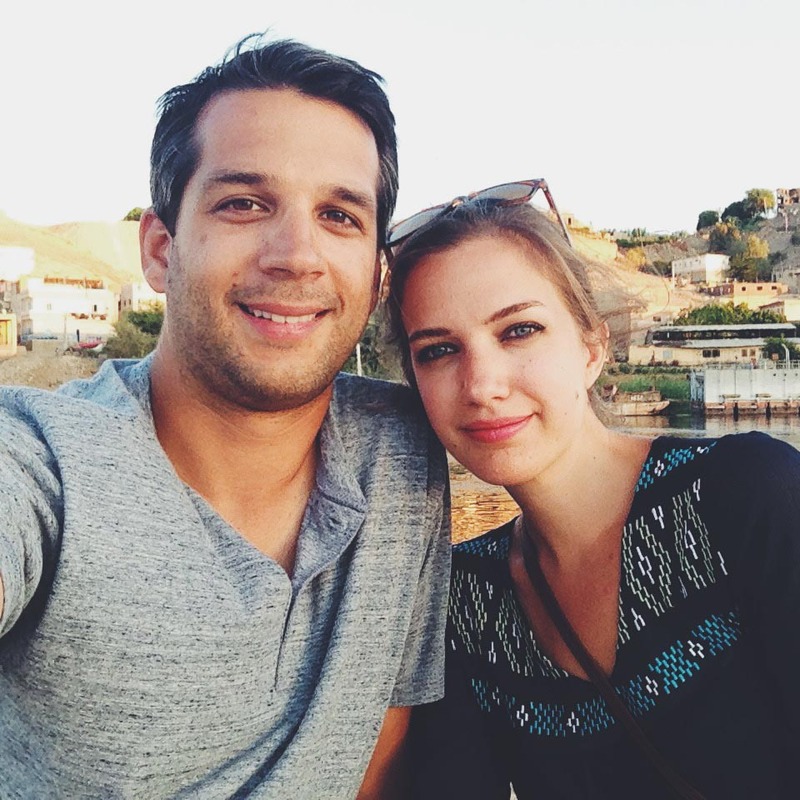 Walk along the street to access the other main attractions of the city. Watch your step, as the limestone paving blocks have weathered and could create a tripping hazard. Showcasing even more columns, the cardo is the main artery of the city and extended about half a mile (800m). Be on the lookout for the spectacular Nymphaeum. The intersection of the cardo maximus and south decumanus. The limestone paving blocks show weathering and ruts from the chariots that used to traverse the cardo. 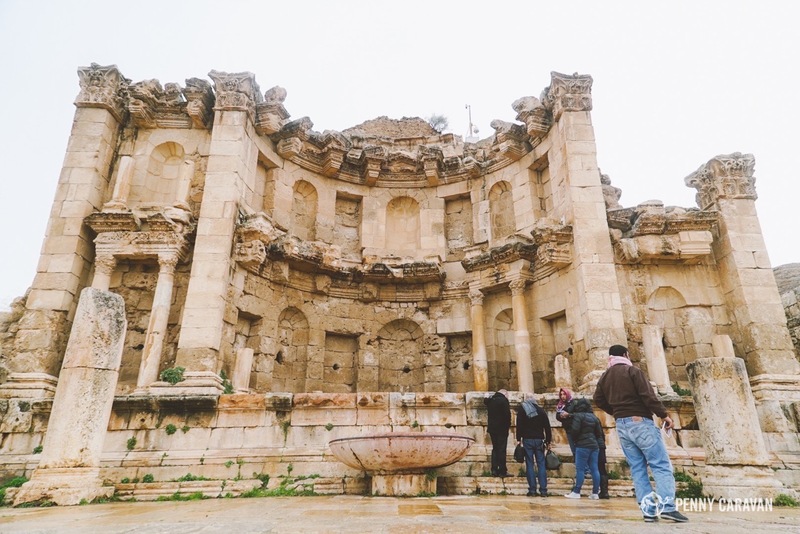 Dating to the second century, the Nymphaeum is a public water fountain that is a highlight of Jerash, showcasing beautiful ornamentation and testifying to the splendor of the city. Publics work such as this were always hallmarks of Roman cities, and the Nymphaeum would have had an important role in the life of the citizens of Gerasa. Imagine meeting up with friends here before heading down the cardo to catch a show at the theater. Water once cascaded down the elaborately-decorated facade of the Nymphaeum into a pool below, which certainly must have been a sight to behold! 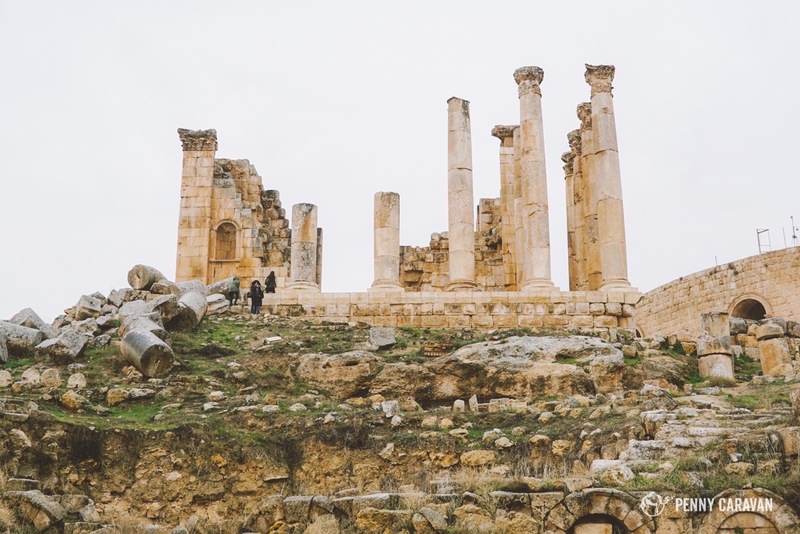 Best approached from the east, up a grand stair case that will slowly reveal the full view of the temple as you ascend it, the Temple of Artemis is built upon a large platform and would have had a dominating effect in its heyday. Noted for the lavishly-carved Corinthian columns, this temple was in service to the patron goddess of ancient Gerasa, Artemis. 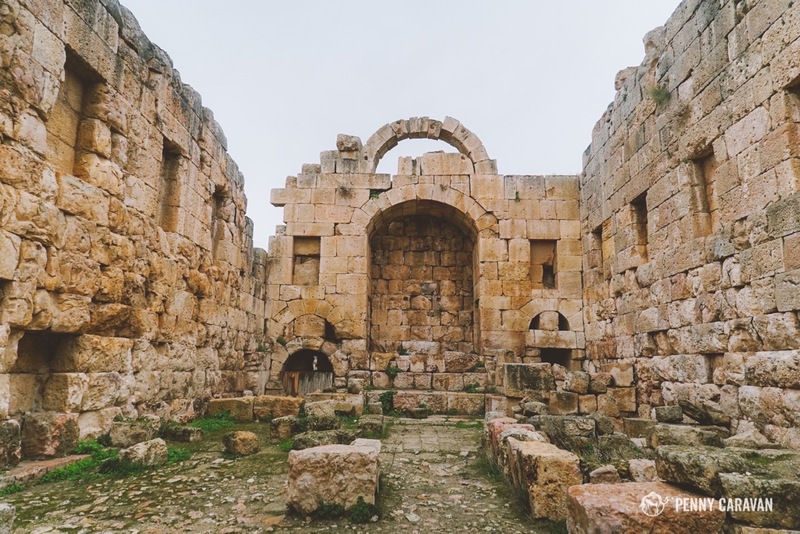 It was subsequently plundered for building materials for churches in the Byzantine era, and had a stint as an Arab fortification before being destroyed by Crusaders. Still, enough remains to impart a sense of the importance the temple served in community life. Ascending the Propyleum, gateway to the Temple of Artemis. Eleven columns still stand at the Temple of Artemis. 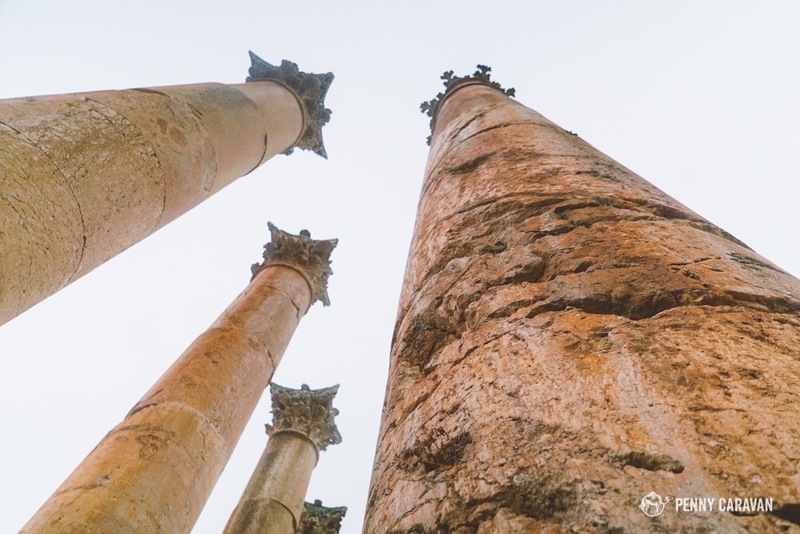 These represent just a handful of the highlights of Jerash. 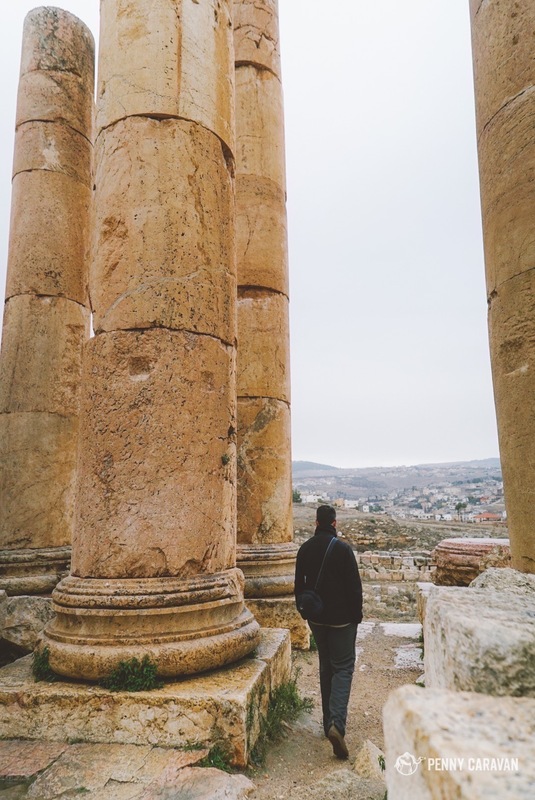 The depth of Jordan’s wonders really become evident when you look beyond Petra, with Jerash opening the door to the rich treasures. 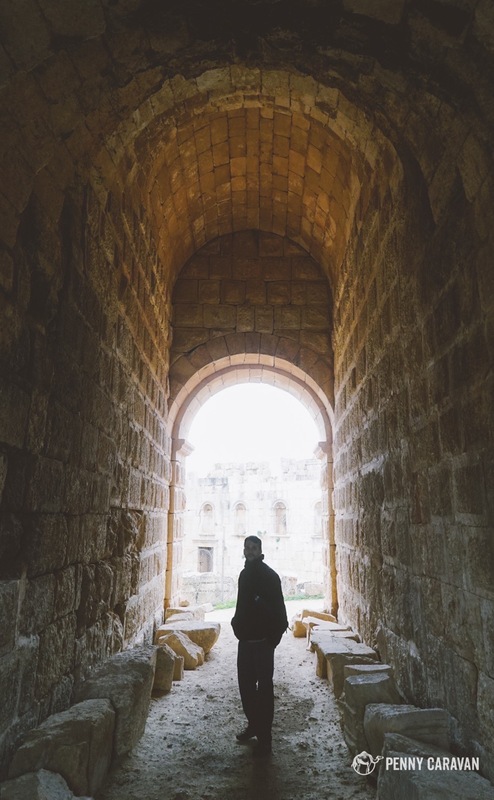 If visiting Petra has put Jordan on your radar, then hopefully this post reveals Jordan as much more than the red city. 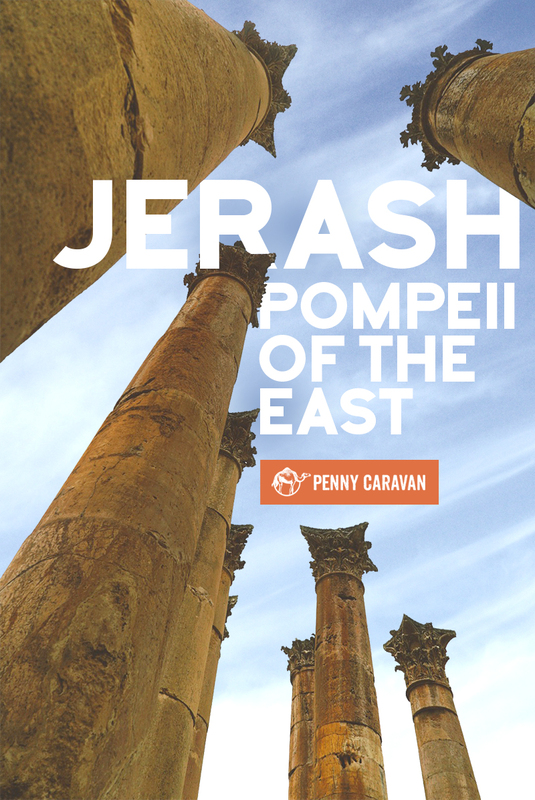 With Petra and Jerash as anchor points, you can begin to plan a route to discover everything that lies between.